The Loudoun Soil and Water Conservation District, in partnership with the Leesburg Environmental Advisory Commission (EAC), will offer four rain barrel workshops in Leesburg during April and May 2018. While the workshops are open to all, Leesburg residents can receive a discount on rain barrel purchases, through a Town of Leesburg program sponsored by the EAC. “Rain barrels have two main benefits,” explains Charles Greenough, chair of the Leesburg Environmental Advisory Commission. “First, by capturing the water that runs off your house’s roof, a rain barrel reduces the amount of stormwater that flows into our storm sewer system. 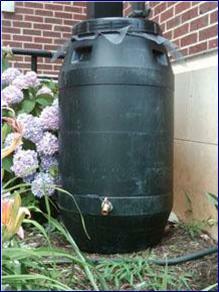 Second, you can use the water from your rain barrel on your lawn and garden. It’s free water. Who doesn’t like something that’s free?” The rain barrel workshops will be held at Tuscarora Creek Park (425 Solitude Court SE, Leesburg, VA 20175). Participants are reminded to dress appropriately if they will be constructing their own barrels. Complete the registration form and send with check to: Loudoun Soil and Water Conservation District; 30 Catoctin Circle, SE., Suite 218; Leesburg, VA 20175. For more information, call Suzanne Brown, District Operations Manager for the Loudoun Soil and Water Conservation District, at 571-918-4530, ext. 105.